Filing Statement of Claims in the local county small claims court may be a more efficient use of an association’s time and money when attempting to collect outstanding assessments. During these unpleasant economic times, mandatory membership associations with tight budgets are constantly looking for ways to collect outstanding monies owed from homeowners in the most expeditious means as possible. Although filing a lien on the property of the owner is a great collection tool, there are circumstances that could wipe out the lien, such as when the property of the owner is foreclosed upon by a lender. Associations often find it necessary to also pursue the homeowner in court by seeking a personal money judgment. Generally, the Association can choose to file a suit in the county where the owner resides and the Association can do so in small claims, State or Superior Court. There are pros and cons for filing suit in each of the three types of courts, but small claims court may prove to be the swiftest and most economical way to obtain a judgment, as well as collect on the judgment. Small claims court is the most informal of the three types of courts. It is often referred to as the “People’s Court.” Most of the time, the owners who are sued in small claims court will appear “pro se”, which means they appear without an attorney. As everyone knows the fewer attorneys that are involved in anything, the less complicated and the less costly things become, right? The small claims court usually has pre-printed forms where an Association’s attorney can simply fill out by hand the amounts owed by the owner to the Association. There is nothing fancy involved. Usually, there are blank spaces on the form to fill in the principal amount owed, the attorney’s fees and the court costs incurred. A Sheriff’s return of service form also is filled out at the time of the filing of the statement of claim so that a representative from the Sheriff’s office can then attempt to serve the owner who is being sued by the Association. When the statement of claim is filed and the owner is served by the Sheriff, the owner has thirty (30) days to respond by filing an answer with the small claims court. If the owner fails to timely file an answer, then the Association can immediately seek default judgment against the owner. If the owner files an answer, then the case is set for a bench trial hearing. At the hearing, before the Judge will consider holding a bench trial on the matter, the parties will be required to informally and in a civil manner go out and conference with one another to try and settle the matter. If an agreement can be worked out among the parties, there is usually a Consent Judgment prepared and signed by all parties, which sets out how the owner is going to repay the Association. Due to residents losing their jobs or having other issues, such as family illness, etc., it is often better for the Association to enter into a Consent Judgment with the owner and have the owner pay some amount per month over time than to not collect anything at all from the owner. In other words, the Association’s obtaining a judgment against the owner, be it by default or after a bench trial, does nothing for the Association if it cannot collect on the Judgment. Accordingly, the Association should try to work out a re-payment plan that is reasonable for both parties. Payment plans should usually only be extended through the end of the particular calendar year so that when the assessments for the following year become due, the owner will not be trying to catch up on previous year’s assessments that are outstanding. One of the limitations that an Association may run into is the jurisdictional limits of the small claims court. The small claims court can only hear cases that do not exceed a claim of $15,000. It would be rare for an Association to sue an owner in small claims court for assessments totaling $15,000, but there are times when an owner may owe not only outstanding assessments, but also fines. So be careful that if your Association sues an owner in small claims court, it must stay within the $15,000 jurisdictional limit. Another limitation in the small claims court is that the Association cannot make an owner take any particular action because the small claims court is not a court of equity. In other words, if the Association wanted to make an owner mow his or her grass or correct some other covenant violation, then it would have to sue the owner in the Superior court, since the Superior court is a court of equity. The small claims court can only deal with contract issues, such as outstanding homeowner association dues or fines that are owed to the Association. If the Association is victorious at obtaining a judgment against an owner in small claims court, the owner can appeal the judgment to either State or Superior court. The legal term for this type of an appeal is called “de novo”, which means that the case is tried anew as if it had not been heard before. The advantage to the Association if this happens is that it allows the Association to have already run through the events in small claims court so that it will be even more prepared the second time around. Also, if the owner has not paid the assessments or fines legally due and owing to the Association, it is highly unlikely that he or she will win in State or Superior court. It just means that the owner is attempting to use all of his or her procedural rights to prolong the inevitable. The advantages of an Association pursuing a personal money judgment in small claims court far outweigh any of its disadvantages and are likely the most efficient and economical means of collecting outstanding assessments from delinquent homeowners. 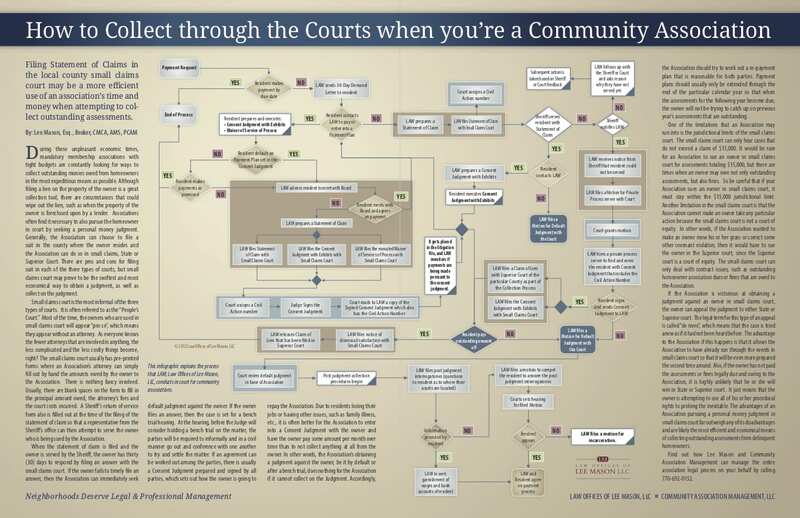 Find out how Lee Mason and Community Association Management can manage the entire association legal process on your behalf by calling 770-692-0152.